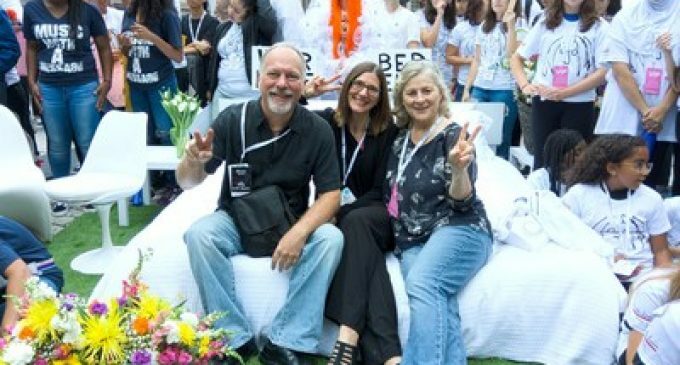 Bruce Mandel, Jen Soule and Patricia Strauch at the Lennon Bus’s Come Together NYC residency kick-off event outside City Hall in New York. The John Lennon Educational Tour Bus is presented by OWC. WOODSTOCK, Ill., Sept. 19, 2018 /PRNewswire/ — OWC®, a leading zero emissions Mac and PC technology company, along with the John Lennon Educational Tour Bus, presented the Come Together NYC residency event at New York City Hall on September 13th. The event kicked off the Lennon Bus’s month-long residency in and around the boroughs of New York. OWC hosted their “Come Together with OWC in NYC” giveaway winner Bruce Mandel throughout the events, which culminated in Ringo Starr and his All-Starr’s Band’s concert at Radio City Music Hall on Thursday evening. Attending the launch were Yoko Ono Lennon, Ringo Starr and Jeff Bridges, along with OWC Founder & CEO Larry O’Connor, President Jen Soulé, NYC Mayor Bill de Blasio, and Lennon Bus Founder & Executive Director Brian Rothschild. 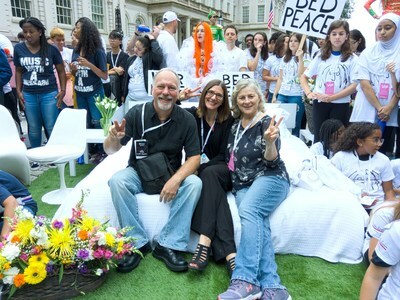 The morning kicked off with speeches from student activists, a check presentation to the winners of the John Lennon Songwriting Contest winners, a “Give Peace A Chance” sing-along, and a “Bed-In for Peace” in front of City Hall. Legendary rock photographer Henry Diltz was on-hand to capture images of the morning activities and hosted a reception at his Morrison Hotel Gallery for attendees on Thursday afternoon. OWC is the 2018 Presenting Sponsor of the Lennon Bus and delivers premium storage and memory upgrades that keep the mobile production facility crafting at top speed and capable of safely capturing the content created onboard, as well as providing financial support for educational programming as the bus travels across the country. Find out more about OWC’s technology products at www.owcdigital.com and www.macsales.com. The John Lennon Educational Tour Bus presented by OWC is a non-profit state-of-the-art mobile Pro Audio and HD video recording facility that provides hands-on experiences for students of all ages. Now in its 21st year, the Lennon Bus features the latest audio and video technology, gear and products. The Lennon Bus travels across the U.S. and Canada year-round, providing free tours and workshops at schools, retailers, festivals, and at major industry conferences. To see where the bus will be next, visit https://www.lennonbus.org/schedule. In 1988, at the age of 14, Larry O’Connor founded Other World Computing (OWC). For over 30 years, OWC has been about possibilities. We’re dedicated to helping tech enthusiasts and industry professionals do more and reach higher. Our trusted storage, connectivity, software and expansion solutions enable creative professionals, producers, educators and government entities to get the most out of their technology investments, protect valuable digital assets and expand their hardware’s capabilities to keep up with the demands and evolution of their work. OWC features an award-winning technical support team that is on hand 24/7 as well as an unparalleled library of step-by-step installation and support videos. In everything we do at OWC, we believe in making a better world where technology inspires imagination and everything is possible. “Lennon” and “John Lennon” are trademarks of Yoko Ono Lennon. Licensed exclusively through Bag One Arts Inc.
© 2018 Other World Computing, Inc. All rights reserved. Apple and Mac are the trademarks of Apple Inc., registered in the U.S. and other countries. Other marks may be the trademark or registered trademark property of their respective owners.